A person who gives a gift this holiday season must be sure they are not giving an unwanted responsibility. 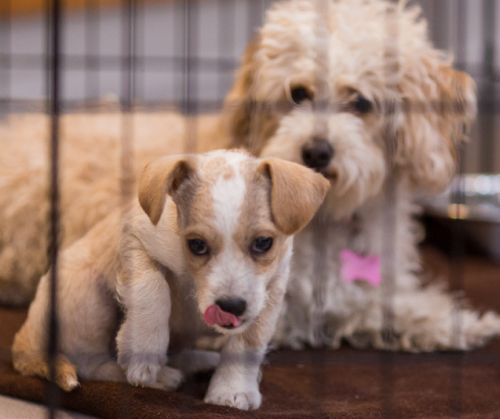 While Christmas may seem like the time to give a friend or loved one an adoptive pet, shelters encourage shoppers to be careful when considering getting a pet for someone else. Shelters often see an influx of animals returned to cages after the holidays due to overeager shoppers. To combat this, Martin urges buyers to purchase adoption gift certificates instead or make a donation to the shelter in a friend’s name. The shelters don’t want to discourage adoption during the holidays, however. Rather, they want to stress that these pets will become family members. As such, shelters are doing promotions to increase their outreach and awareness. The Utah Humane Society scheduled their first three-hour “Hope for the Holidays” telethon December 1st on Fox 13. Several animals were showcased along with many adoption success stories. “We’ve never had a chance to do something like this. We hope it becomes an annual tradition here,” says Arky. On a smaller scale, Best Friends has initiated the “Adopt ‘Til you Drop” campaign, which charges only $25 to adopt an animal in December. The Humane Society alone houses around 500 animals per day. However, the shelter has not euthanized a single adoptable dog in the last four years. They currently boast an 80% adoption rate. Similarly, Best Friends boasts a no-kill policy and recently launched their “Save them All” campaign. The main reason we have homeless pets is because of overpopulation. “People don’t spay or neuter their animals,” says Arky. To find an adoptable pet near you, visit petfinder.org. The site shows photos and descriptions of all adoptable dogs by zip code, state, region, or the entire nation.